Kenyon and its Jewish community received an extraordinary gift this fall with the arrival of a Torah scroll that disappeared during the Holocaust but was recently recovered and restored. The hand-lettered parchment scroll, bearing Judaism's fundamental writings, was acquired for the College by Kenyon parents Michael Salzberg and his wife, trustee Deborah Salzberg, of Bethesda, Maryland. They joined the campus community, other trustees, and visiting religious dignitaries in October for a dedication ceremony. Several dozen members of the community had the rare opportunity to assist in the final restoration process, inking Hebrew letters onto the scroll with a quill, thereby completing the text and symbolically connecting the ancient words to current and future generations in Gambier. 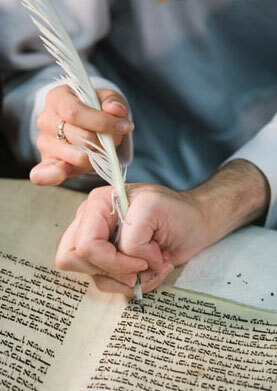 They held the quill as the letters were filled in by Rabbi Menachem Youlus, the scribe who restored the scroll, which he estimates to be 175 years old. "To any Jewish community, the Torah is a living, breathing text; a Jewish community needs the Torah in order to thrive," said Kenyon Hillel Director Marc Bragin. Comprising the Five Books of Moses (Genesis through Deuteronomy), the Torah traces the history of the Jewish people and sets forth the commandments that Jews should follow in order to live a just and moral life, both individually and communally. He noted the special significance of a Torah once used by a Jewish community that was eradicated in the Holocaust. "This is a statement of survival," Bragin said. This particular Torah's journey to Gambier entailed both Kenyon and Salzberg family connections. The journey began in the fall of 2006, when Bragin, newly arrived at Kenyon, mentioned the need for a Torah to Alan E. Rothenberg '67, a trustee who has been actively involved in supporting the College's Hillel chapter. Rothenberg spoke to fellow trustee Deborah Salzberg, knowing that her husband Michael took an interest in the restoration of Torahs damaged during the Holocaust. Michael Salzberg immediately thought of Rabbi Youlus, a sofer, or scribe, whom he had met in the Washington-area Jewish bookstore where the rabbi works. He discovered, moreover, that the rabbi's organization, Save a Torah, had recovered a scroll from the very region near Lvov, Poland (now in the Ukraine), where the Salzberg family had lived. Some of Michael Salzberg's relatives survived anti-Jewish pogroms and emigrated to the United States prior to World War II. Others died in the Holocaust. Youlus, who began tracking down lost Torahs about twenty years ago, estimates that thousands of scrolls survived the Nazis' devastation of European Jewry. Some Torahs were hidden away. Others were thrown into mass graves along with murdered Jews. Still others were taken by individuals, who kept them for altruistic or mercenary reasons. The Nazis themselves kept many Torahs, intending to display them as artifacts of a dead culture. At Kenyon, Youlus recounted some of his adventures in recovering Torahs while describing the mix of traditional art and modern technology he employs in analyzing the condition of scrolls and then restoring them. He and several other scribes spent four and a half months repairing Kenyon's Torah. A Torah contains nearly 305,000 Hebrew letters, and about two-thirds of the letters in this scroll were cracked or otherwise damaged and had to be corrected or entirely rewritten. The Torah will be kept in the College archives but taken out regularly for religious services. Bragin also hopes that religious studies classes will have access to the scroll. Plans are under way to design and build an ark, the ornamental cabinet used in synagogues to hold Torahs.